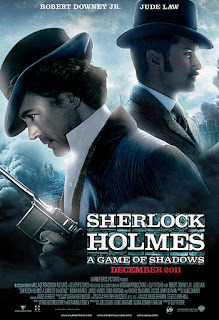 The sequel to Guy Ritchie's 2009 Sherlock Holmes reboot has just as much style, period atmosphere, wit and bite, but suffers from a rather baggy script from husband and wife team, Michele and Kieran Mulroney. The result is a film that is certainly entertaining enough to justify a cinema ticket, but which propels the franchise no further, and does a great disservice to Noomi Rapace and Stephen Fry, stranded in under-written roles. The movie is set in the Europe of 1891 - a febrile, uncertain place with anarchists rising against major powers, and the major powers signing peace treaties but all the while gearing up for what will become the First World War. Holmes' arch-nemesis, Professor Moriarty (Mad Men's Jared Harris) seeks not just to corner the supply of weaponry but also to create the demand for them, by staging terrorist plots and assassination attempts that will bring Europe to war. Holmes (Robert Downey Junior) has to stop him, aided as always by his side-kick John Watson (Jude Law), interrupting his honeymoon with Mary (Kelly Reilly). The movie thus takes the result of a fast-paced, action-set-piece-packed ride across Europe, from London to Paris, by way of Cambridge, and on to the fateful Reichenbach Falls. Along for the ride are Holmes' indolent but secretly powerful elder brother Mycroft (official National Treasure, Stephen Fry) and a rather random gypsy called Simza (Noomi Rapace - the original Lisbeth Salander). First the positive. All the things that made the first SHERLOCK HOLMES a roaring success are present in the second. I love the dark, richly dressed sets, and CGI that bring to life the grim dirty Victorian cities of London and Paris, filled with dodgy clubs, filthy streets, but punctuated with glorious civic architecture and handsomely dressed upper class men and women. For the keen-eyed, there's even a glimpse of the Sacre Coeur under scaffolding in Paris harking back to the use of an unfinished Tower Bridge in the first film. I also love the way in which Ritchie gives us a more pugnacious Holmes than those dessicated twentieth century TV adaptations. This feels truer to the books, where Holmes definitely has a grimy past and is in fine physical form. I also love the device Ritchie uses to show his process of deduction - the careful editing, the bullet time replay of fights, the voice-over of every move selected. It all makes for the movies vitality and takes the novels back to their pop-cultural origins. But most of all, any Holmes adaptation lives or dies on the relationship between Holmes and Watson, and what really sets these films alight is the genuine spark between Downey Junior and Law - the beautifully essayed mutual frustration, respect and affection. I will always hand over money to see Holmes and Watson sparring. Finally, to all these factors, we can add one more happy decision. Jared Harris makes a superb Moriarty, and some of the best scenes in the film are (as they should be) the confrontations between the two - the matching of wits. All these good things just about make for the perfect winter blockbuster. But, as I said before, the movie is severely let down by its script by Michele and Kieran Mulroney. To be sure, they get some things right. I like the way small details early in the movie become important gags or plot points later on, particularly the urban camouflage! This is a film in which one has to pay attention despite the superficial appearance of a brawny action flick. But in too many major ways their script gets it horribly wrong. The pacing in the first half is woefully slow. There are some fun action set pieces but we don't really feel we know what the stakes are - what precisely Holmes is trying to do, what mystery he is trying to solve. It's more than an hour into the over-long two hour run-time before we realise what the plot really is. Poor Irene Adler (Rachel McAdams) is pretty much thrown to the dogs, with barely an impact on Holmes. But worst of all, the whole gypsy plot line is also a complete waste of time. You could easily have cut it from the film and had a tighter, more evenly paced 90 minute flick. Presumably Guy Ritchie was happy to have another opportunity to indulge his fascination with gypsies, but is all that nonsense really worth it for 60 seconds of comedy dancing from Jude Law, and a short horse joke? As it is, we get poor Noomi Rapace cast as Simza - a talented actress who basically looks pained for 120 minutes. Moreover, poor Stephen Fry is utterly short-changed in his role as Mycroft - I mean - what comic joy could have been woven from an encounter between Fry and Downey Junior on screen! But the screenwriters simply had a naked arse gag. Poor. The storyline also leaves poor Kelly Reilly rather short-changed as Mary, although she, unlike Noomi Rapace, does manage to steal every scene she's in and leave a favourable impression far outweighing her actual screen-time. Let's hope now that Simza has been rendered irrelevant, Mary and Mycroft will get more screen-time in the next film. And yes, I suspect that given the early box office there will be another film. And yes, this instalment was still enough fun, despite its flaws, that I look forward to it. I only hope that the producers replace the screenwriters. SHERLOCK HOLMES: A GAME OF SHADOWS is on release in the US, UK, Canada, Hong Kong, the Netherlands, Ireland, Italy, Sweden and Turkey. It opens on December 22nd in Malta, Germany, Israel, Singapore, Slovenia, Thailand, Finland, Indonesia, Romania and Taiwan, Denmark and Norway. It opens on December 29th in Belgium, Kazakhstan, Lebanon, Russia, Estonia, India, Lithuania and South Africa. It opens on January 5th in Armenia, Australia, the Czech Republic, Greece, Hungary, Portugal, Spain and Poland. It opens in Brazil on January 13th; in France on January 25th; and in Japan on March 10th.